How do you want to look on your wedding day? Sparkly? Elegant? Dream-like? Me? I just want to look good for one pair of eyes(i.e. my husband ofcourse ;)). Rest of it doesn’t matter so much or does it? Now… I believe, wedding should be a celebration of the fact that you are ready to spend your whole life with someone. Rather than being on the criticism platform for the hundreds and thousands you invited.. How ironic isn’t it? This happy day for the couple itself becomes one of the most stressful days in their life. No amount of preparation can prepare you for the criticism that you might have to swallow at the end of the day. Don’t get me wrong.. Ofcourse! I want my day to be perfect but not at the cost of all the happy emotions, in order to make the ‘perfect’ wedding. Because in the end, you just want to have your ‘D-day’ remembered by you as a day when you felt loved… the most. Please feel free to leave your comments below on this post.. Will be happy to hear from you..
Well, the thing about being a movie buff is that every time you see an inspiring movie, you have to tell someone about it! 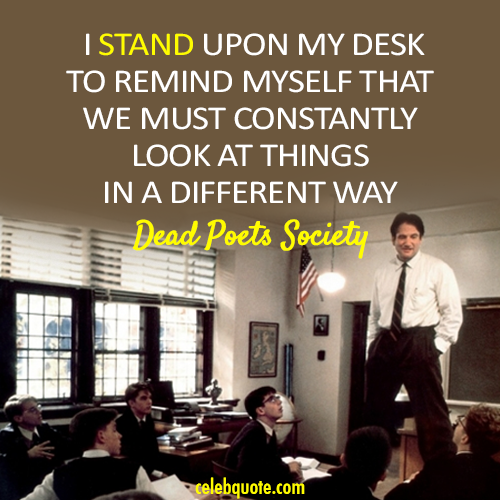 This week the movie which inspired me : Dead Poets Society. If you haven’t seen this , you need to. Trust me, it will help you to see things in a different light. We have so many options but still we are confused of what we want among those options. When we were kids, we knew what we wanted, when we had set our eyes on ‘it’. It was love at first sight. We just knew….we got to have that or we will just die. There was that time and here is now. We are so much mature than what we were few years back, and ironically, we don’t know what we want now in our life. Everything confuses us. EVERYTHING! There is a choice paradox -we are given so many choices and because we have grown up, we need to act like grown up. We need to look at the pros and cons of all the stuff that we think we want. The love-at-first-sight phenomenon doesn’t have its intended effect on us. We have become too guarded. What should one do then? We can’t go back now… as we are all grown up. We know that we are indecisive about our choices most of the time and “it depends” forms the answer to most questions that life throws at us. So let’s do one thing, at least we know what we don’t want in our life. Our years growing up has at least taught us this that somethings shouldn’t be in our life no-matter-what. Everyone knows that feeling right? So let’s just do exactly that and see how this choice paradox in our life gets little better, if not, solved completely. The ‘no-goal’ decision taken in my previous post Do we always need to have a goal? is not working for me. I tried hard to not to pick up a goal and lived like that. But I realized that without a goal, am pretty much a couch potato (Useless). Going to learn a new language: I always wanted to learn a new language. So I will just randomly pick on one language and try to learn at least the basic syllables so that I am able to, at least, converse at a basic level. Are you getting a Geek alert from me ?? Sorry am not one! Learn to be with a pet: I know you’ll be thinking what a weird person. I must tell you I am literally afraid of all kinds of pets. So I am going to be with a pet and be very friendly with it. Fingered crossed !Will complete this without freaking out. Learn a musical Instrument: This will go into my long term plan, as I know from my experience that learning a musical instrument takes practice -lots of it. So I have a keyboard at home, I’ll get it from my hometown when I go for Christmas. So sadly, it will shift to next year. These are the goals that I can think of right now. It will evolve, I know with time, as I grow, as I go to new places and as I get to know more people . Let me know about your goals and your struggles surrounding it. Will love to hear from you guys. Do we always need to have a goal? Today as I was going for lunch, I was thinking about the project I was working and planning how to do the best in it. Thats when i realised that i was always planning about future, I mean, every sec of the day! I am person who has been always focused in life. There has never been a time when i dint have a goal in my mind. In childhood, it was to become a doctor(dint happen! ouch! )but well i has a goal. Smaller ones we tend to forget as we achieve it like winning that sprint or getting spared from punishment. From graduation till today, I had always some or the other goal in my mind, to keep me working towards it and to avoid being lazy basically. But i wonder what would have happened if I had let go. What would happen if I dint think about tomorrow and just live(That’s what all the quotes now-a-days are about. right?) what if I did just that–I wonder will I succeed /fail /get lost? What do you think ,dear readers? Happy to always hear from you. Why would you do that to yourself? Who would you talk to? It’s so difficult to do everything on your own. Ridiculous! But by the way, everything is true. Despite all of this, people opt to stay by themselves. WHY? I stay alone so that I can come back to a peaceful home after a tiring day and after that, all I want to do is sip a cup of coffee and curl to watch my favorite movie or read a book I have been dying to read all day. Do you stay alone?? If yes, why?? To be alive is to be awake.